For the 2011 American film, see Sand Sharks. Sand sharks, also known as sand tiger sharks, grey nurse sharks or ragged tooth sharks, are mackerel sharks of the family Odontaspididae. They are found worldwide in temperate and tropical waters. The three species are in two genera. The long, narrow and sharp teeth of Odontaspididae (here Odontaspis ferox). The body tends to be brown with dark markings in the upper half. These markings disappear as they mature. Their needle-like teeth are highly adapted for impaling fish, their main prey. Their teeth are long, narrow, and very sharp with smooth edges, with one and on occasion two smaller cusplets on either side. Sand sharks have a large second dorsal fin. 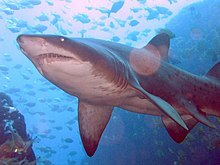 The sand shark can grow up to 3.2 m (10 ft) long, and most adults can weigh around 200 kg (440 lb). The average lifespan of both sexes is only about 7 years, though they may live longer in captivity. The name sand shark comes from their tendency toward shoreline habitats, and they are often seen swimming around the ocean floor in the surf zone; at times, they come very close to shore. They are often found in warm or temperate waters throughout the world's oceans, except the eastern Pacific. They also frequent the Mediterranean and Adriatic Seas at depths from 20 to 200 m (66 to 656 ft) and sometimes more. The sand shark has a unique hunting strategy. It is able to gulp air from above the surface and collect the air in its stomach. This enables them to become buoyant and approach their prey virtually motionless. During the day, the sand shark stays mostly inactive, but at night, it becomes active and resumes hunting activities. Their staple is small fish, but they will eat crustaceans and squid, as well. They occasionally hunt in shivers (groups), and have even been known to attack full fishing nets. Sand sharks only develop two embryos, one in each uterus. The largest and strongest embryos consume their siblings in the womb (intrauterine cannibalism) before each surviving pup is born. It has one of the lowest reproduction rates of all sharks and is susceptible to even minimal population pressure, so it is listed as vulnerable and is protected in much of its range. Sand sharks are not known to attack humans. If a person were to provoke a sand shark, it may retaliate defensively. Sand sharks are generally not aggressive but will harass divers who are spearfishing. In North America wreck divers regularly visit the World War II shipwrecks to dive with the Sand Tiger sharks that make the wrecks their home. A recent report from the PEW Charitable Trusts suggests a new management approach used for large mammals that have suffered population declines could hold promise for sharks. Because of the life-history characteristics of sharks, conventional fisheries management approaches, such as reaching maximum sustainable yield, may not be sufficient to rebuild depleted shark populations. Some of the more stringent approaches used to reverse declines in large mammals may be appropriate for sharks, including prohibitions on the retention of the most vulnerable species and regulation of international trade. The family contains three extant species, in two genera, as well as many extinct species in several genera. ^ a b Froese, Rainer, and Daniel Pauly, eds. (2009). "Odontaspididae" in FishBase. January 2009 version. ^ the-shark-side-of-life.com. "Sand Sharks". The Shark Side of life. ^ "Sand Tiger Shark Profile". National Geographic. National Geographic. Retrieved 17 May 2013. ^ Martin, Aidan. "Intrauterine Cannibalism in Sharks". elasmo-research.org. Retrieved 2 July 2015. ^ "The IUCN Red List of Threatened Species". iucnredlist.org. Retrieved 2 July 2015. ^ "Fossilworks: Odontaspinae". fossilworks.org. Retrieved 2016-05-08. ^ "SHIMADA, K. & POPOV, E.V. & SIVERSSON, M. & WELTON, B.J. & LONG, D.L. (2015) | Literature | Shark-References". shark-references.com. Retrieved 2016-05-21.